The CommSolid office moved to a new (for the majority of the team old ;-)) location in the Waldschlösschen area in Dresden. The relocation day was sunny and warm. 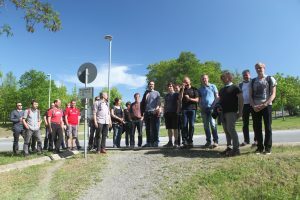 The event at the day of the move started at the old office at the Infineon area. 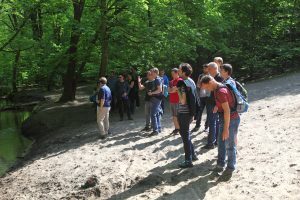 During the hiking tour through the Dresden Heath we received some valuable lessons beyond our usual engineering business. We started it with a hike through the Dresden Heath from the “old” office at the Königsbrücker Straße to the Waldschlösschen. Here we entered our new office space and dedicated our roof terrace with a barbecue compiled of sausages and steaks as well as self-made salads and cakes. 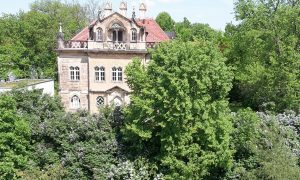 And of course we enjoyed the view to the Waldschlösschen framed by lilac flowers in one direction and over the Dresden skyline to the other. By the way – in the last weeks further nationalities joined our team– for us always an increase in experience and inspiration in both working and cultural environments. We still have open positions. If you are a skilled engineer seeking for new challenges or if you want to collect practical experiences during master or PhD studies – just browse our job offers! The Waldschlösschen framed by lilac flowers as it can be seen from our terrace.